First things first, I am sorry for the lame pun title of this post. … I can’t help it; I am cursed with an undying love of dad jokes and pun-related humor. Second things second; how amazing is this women’s orange pant suit?!?! Sometimes you just need to break away from the black & white of corporate style and wear something bold – this bright colored suit, definitely fits the bill! 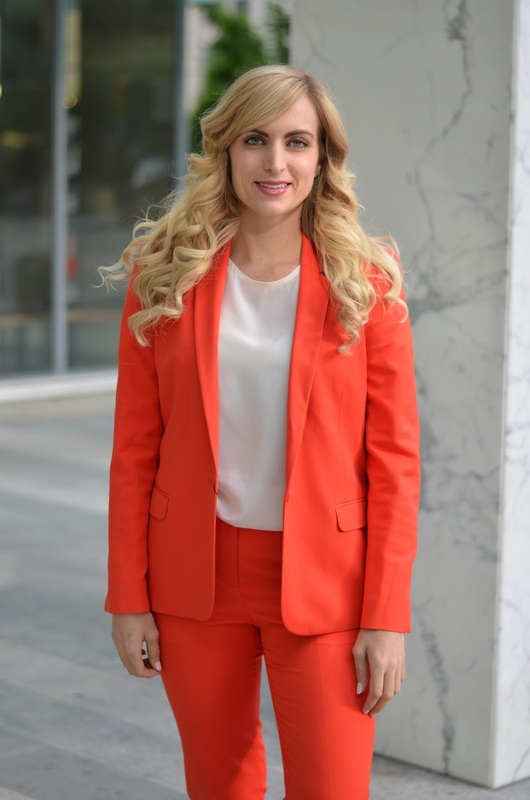 Summer is the perfect time to incorporate more color into your wear-to-work wardrobe and bright orange and bright yellow are particularly trendy this season. If you’re not bold enough to wear a full colored suit; try just wearing one piece or the other to make yourself more comfortable with bright colored work wear. The orange pants would be perfect with a white blouse, and the orange blazer would look polished but summery with a navy work dress. Since I was stepping out of my work wear comfort zone and wearing this bold orange suit, I figured I might as well stick with the bold choices and wear running shoes instead of heels. A big trend on the runways this season was runners worn with suits, and I for one am a HUGE fan of any fashion trend where my feet get to be more comfortable *happy dance*. You can’t go wrong with all white sneakers, they go with almost everything! Speaking of summer and work; I am actually really excited for work this summer. I found out that I will be taking on some extra work at one of the courthouses near me which will mean extra income and more hours of work I really enjoy doing! Hopefully I can incorporate some bright work wear into my style as I take on this new work project! "Classic Work Wear – Button Down & Pencil Skirt"
Fantastic outfit! The color is stunning on you! Thank you so much! And thanks for taking the time to stop by and comment! Oh i love this look1 i would never think of pairing such a vibrant suit with sneakers but you styled it so well, I'm inspired! Thank you SO much! I love when I can inspire people to try something new! I've got another suit with different sneakers planned for the blog next month, so hopefully you'll like that too!